A random eyelid twitch does not evoke much thought for most people, but others notice that something is out of the ordinary when their eyelid is twitching. Although most eyelid twitching is harmless, when is it actually a true problem that needs medical attention? After reading through the basics, give us a call if you think you need more serious attention. In general, the involuntary and repetitive spasms that cause eye twitching is due to muscles in that area called blepharospasm. Any kind of agitation of these muscles that control the eyelid can induce tics, twitches or spasms. They have been known to last seconds, hours, days, or even weeks. There are several common causes for persistent eyelid twitching that are completely normal. 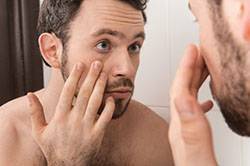 For instance, lack of sleep, stress, drinking too much alcohol and coffee, being hungry, smoking, or computer screen eyestrain is all causes to make the eyelid muscles twitch. One of the easiest ways to treat these eye twitch causes is stopped doing the activities that promote them. It can be alarming to know that your eye twitches are the sign of something more serious, but in rare cases, this is absolutely true. Viruses and neurological conditions can cause the eyelids to start twitching and are signs you need to seek medical attention immediately. There are also benign reasons that you may have eyelid twitching, such as Bell’s Palsy, that mimics serious conditions. Regular primary care doctors may not understand the finer points of eye health. When you have an eye twitch and something does not seem right, you can come to us for an examination. We will take a look at your eyes and use our expertise to determine if there is a serious issue that you need to address. To get started, schedule an appointment at The Vision Centers today.